No need to keep it open, TM. I just used a different variation for search and wondered what it was. Thanks. Found this pdf relating to Chapter 11 & Energy Partners. Lots of companies listed, including those we've discussed. I had to save it my my hard drive. Delaware EPL of Texas, LLC, and EPL Pioneer Houston, Inc.
during conferencia of prensa of faction red, rudy lampe owing to indica cu have rumornan persistente cu petrochina owing to cumpra the refineria at aruba y by of esey the is tell cu is exigi for have transparencia in all the proceso here. according lampe, of one near is tell cu existencia of the refineria for future of aruba will is positive mirando cu after of 80 year of his existencia already the la become part of aruba y of another near is exigi of previous to minister for come cu all informacion on one possible acuerdo cu will can have cu petrochina. the is ask previous to minister ap come fast y tell if is berdad the rumornan persistente cu have cu petrochina did take over the refineria y also informa con will stop cu the trahadornan if have one deal cu petrochina. “nos know cu in pasado sr. nelson oduber owing to haci deal cu hotel riu y we all conoce the contenido of the deal here. previous to minister owing to give hotel riu one blanco permission cu can owing to importa all material of afor, all producto of afor, all contratista of afor, all trahador of afor y at end of cuenta is a only owing to leave beneficia cu the deal cu sr. nelson orlando oduber owing to haci cu hotel riu, is his casa cu owing to achieve one spa in hotel, but people of aruba self not owing to leave beneficia cu the deal cu sr. nelson oduber owing to haci”, according the leader of faction red. 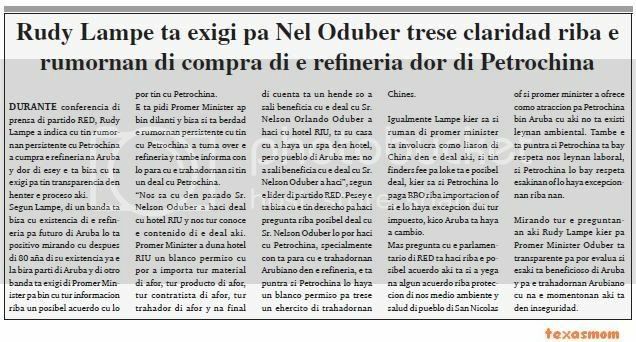 pesey the is tell cu the have derecho for haci question on possible deal cu sr. nelson oduber will can haci cu petrochina, specialmente con is stop cu the trahadornan aruban in the refineria, the is ask about if petrochina will achieve one blanco permission for bring one ehercito of trahadornan chinese. igualmente lampe wanted know if brother of previous to minister is involucra because; liason of china in the deal here, if have finders fee for thing is the possible deal, wanted know if petrochina will pay bbo on importacion or if the will achieve excepcion dui all tax, kico aruba is achieve owing to cambio. more question cu the member of parliament of red is haci on the possible acuerdo here is if owing to arrive at some acuerdo on proteccion of we medio ambiente y salud of people of san nicolas or if previous to minister owing to ofrece because; atraccion for petrochina come aruba cu here do not existi leynan ambiental. also the is ask about if petrochina is bay respeta we leynan laboral, if petrochina will bay respeta esakinan or will achieve excepcionnan on they. mirando all the questions here rudy lampe wanted for previous to minister oduber is transparente for can evalua if this is beneficioso of aruba y for her trahadornan aruban cu at the momentonan here is in inseguridad. ORANGE CITY - The arbitration case between stevedoring and port authority Astec APA begins Monday at ten o'clock in the morning. Astec want a ruling on the dissolution by the APA since 1983 ongoing contract with the government. At the request of the government dissolved the APA contract to launch a tender for an operator of the new container port in Barcadera. One of the reason mentioned was that Astec too expensive. The port and press release sent yesterday, which says that the people do not need to be assured that the container prices down. "These are by APA and more or less half of that goes to APA. It is therefore not correct to insinuate that the rates of Astec high. On the contrary, which are low compared with those in the region, "says the stevedore. The discussion leading up to the arbitration case, this week up. MEP group Ady Thijsen retrieved significantly to the former President of employers ATIA, Juan David Yrausquin. He claimed that Yrausquin in his criticism of government plans for the port, already showed his political color. Yrausquin on the kieslijst of AVP. The candidate denied this yesterday in a press release sent to the media. He says that the government hands all agreements made with a Spanish company and other investors and thus all matter is not transparent about its plans. Astec says in its press release that there is little change when a new port operator is chosen. "There is not enough volume for two operators, so even if Astec by a foreign company replaced still remains the same monopoly exist." Rates will not decline, says Astec stresses that a company with eight local shareholders. The stevedoring also expected that container rates by a foreign operator will even increase because of the profit guarantees that this will require. Astec stressed again that no opponent is moving the container port in Oranjestad to Barcadera. "On the contrary we are even willing to invest there," writes the company. The conflict led last year to various lawsuits. Astec won the case in which they demanded that the tender for a new operator was put stops and only the arbitration court would decide on the dissolution of the contract. This will continue until 2011. Aruba Stevedoring Company, Astec as full name, is founded on August 11, 1983. The Board of Commissioners are the Eman Handelsmaatschappij, port authority APA, Martijn Trading, Meta Corp, SEL Maduro & Sons and Intermodal Container Services. Executive Director Marinus Clean. Helix Energy Solutions Group, Inc. (Helix) is an international offshore energy company providing reservoir development solutions and other contracting services to the energy market, as well as to other oil and gas properties. Helix operates in the Gulf of Mexico, North Sea, Asia Pacific and Middle East regions. The Contracting Services segment utilizes the vessels and offshore equipment that when applied with the methodologies reduce finding and development (F&D) costs. The Oil and Gas segment is engaged in prospect generation, exploration, development and production activities. On December 11, 2007, the Company’s wholly owned subsidiary Cal Dive (CDI) completed the acquisition of Horizon Offshore, Inc. (Horizon). In July 2007, the Company acquired the remaining 42% interest in Well Ops SEA Pty Ltd. On September 30, 2007, Helix 30% working interest in the Phoenix oilfield, the Boris oilfield and the Little Burn oilfield to Sojitz GOM Deepwater, Inc. (Sojitz). I found the stuff in regards to oceanteam,DeepOcean interesting as well as who works for them!IIRC i Think they've got some contracts down in S.A. recently HotPing.You may want to double check..
Did a search first using KTF as the poster, and you will see Kermit, islandmonkey and others also posted info. I will see if there is anything more and will post. Edit to add the last link. Thank You 2NJ for all this on Helix ....You Are AWESOME and You are also a ...I've got lots going on here at home today but I will read all of this later this evening when things are quieter around here....Thanks Again! oranjestad - another week is wait for visit of alpine energy group y bouldin & lawson at aruba for deal the of two phase of the proyecto wastaway y construccion of plantanan similar for energy alternative at aruba. refineria valero at san nicolas is produci coke of petroli also because; producto secundario, y the plantanan of energy alternative here will can haci usage of esey. at us virgin islands, is proyecta cu prijs of water y energy for consumido will descend cu 50%. minister booshi wever also owing to haci one rfp for reduci dumpmento of desperdicio solido of aruba cu 90%. the rfp owing to resulta in seleccion of bouldin & lawson of mcminville, tennessee, for construccion of the first plant wastaway of ultramar, cu in the first phase will reduci dumpmento of desperdicio solido at landfil of aruba cu 50%. will construi plantanan similar also at us virgin islands. monday 10 of august ultimo, governor john therefore. dejongh jr. owing to anuncia cu recientemente water and power authority of us virgin islands (wapa) owing to company two contract of 20 year for compra of energy, y virgin islands waste management authority (wma) owing to company two contract of 20 year for servicio of maneho of desperdicio solido, cu partnernan of alpine energy group llc (alpine), estableci at denver, for construi, posee y opera two plant of energy alternative cu will serve the habitantenan of st. croix, st. john y st. thomas. Yesterday was the decision behind closed doors in the arbitration case between APA and stevedoring company Astec. The three-man commission ruled in favor of APA. The open tender for the operator of the new container port in Barcadera can, after months of delay, start. ORANGE CITY - Aruba Ports Authority (APA) yesterday arbritragezaak won against the stevedoring company Astec. The tender for an operator of the new container port in Barcadera can begin. In a first reaction to this newspaper show of Tourism and Transport Minister Edison Briesen stated that the three-man arbitration panel, consisting in particular of the Chairman of the Arnhem court has ruled that the public interest in this case must prevail in that of a company. "All allegations of APA were accepted by the Commission. In their view, the plan of APA correct and realistic. At the meeting they should explain exactly how outsourcing is implemented, "said Minister Briesen. The arbitration case concerning the dissolution of the continuous contract of Aruba Ports Authority (APA) with Astec stevedoring company was launched February 18, 2009. APA contract - under pressure from the government - by December 31, 2009 terminated. Through a public tender to APA, the operator of the container port Barcadera choose. On March 25 the court forbade Port Authority APA an open call for tenders for an operator of the new container port in Barcadera. "Astec can still compete for that award," said breeze. Next Monday he wants to elaborate on the ruling during a public press conference.